We are excited to announce the launch of our new Cacoo website! Our new website provides better access to features, templates, plan options, customer stories, and product support. Visitors can easily find information about our product offerings, and current users have an improved experience in our support center. 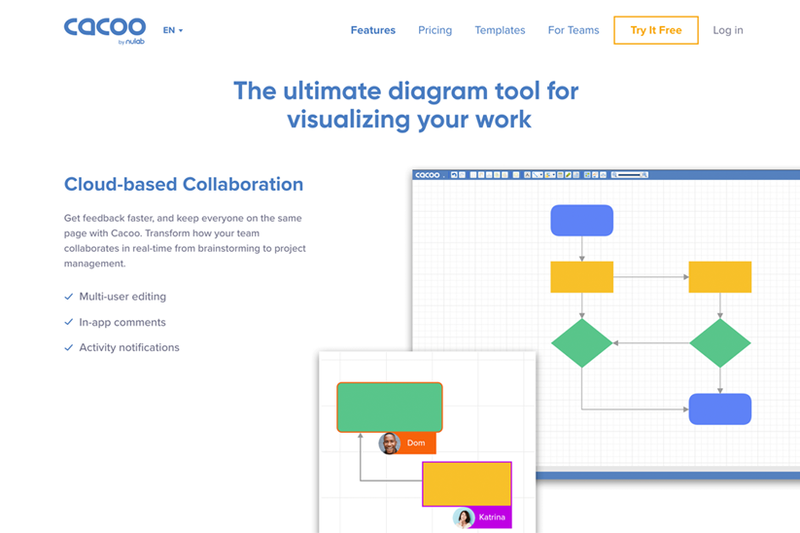 With this website, we focus on what makes Cacoo unique: being a cloud-based software that lets you create and edit professional diagrams with others, in real-time. We updated our Tour page to a more detailed Features page that highlights the benefits of using Cacoo. We also expanded our plan pages to provide more information on which plan is right for you. New additions to the website include a press page with articles featuring our product, an outline of how we keep your data secure, a comparing plans chart, more support content, and over 20 new templates! In addition, we will be consistently adding new content to our website including diagramming guides, video tutorials, blogs, and more. We hope you enjoy our fresh, vibrant website and that you find it helpful when learning about Cacoo. Courtney Courtney is a member of Nulab, the creators of Cacoo.